Cities are essential to achieve not only the New Urban Agenda, an unprecedented statement of intent by 167 countries more than a year ago in Quito, but the Sustainable Development Goals and Paris Agreement, said a series of urban policymakers, experts and activists in Kuala Lumpur on February 11. While this is perhaps not a surprising conclusion from a room full of urbanists, the fact that most of the world’s economic activity and people do now reside in cities makes them an indispensable element to sustainable development. As thousands of people flocked to Malaysia’s capital for the 9th World Urban Forum, WRI Ross Center, the Coalition for Urban Transitions, and C40 Cities held a high-level event, “Thriving Cities, Prosperous Countries: From Agenda to Implementation,” that focused on three core areas of change: housing, infrastructure and financing. 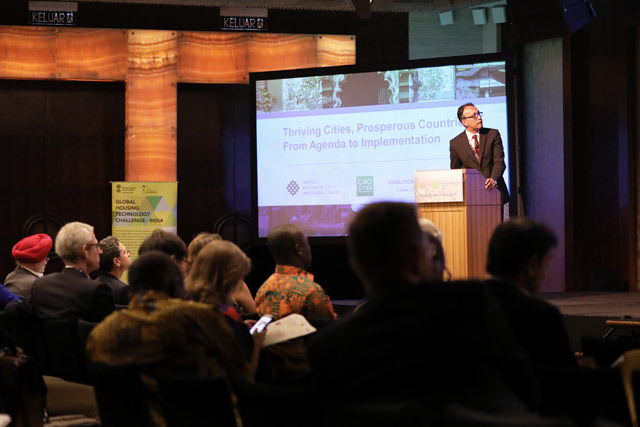 “Cities are not on track,” said WRI Ross Center Global Director Ani Dasgupta, setting the stage for the afternoon. We need to “bend the curve,” he said, towards better urban land use, lower carbon emissions and fewer people living in poor quality housing. What’s clear is that improvements will require much better coordination between city leaders and their counterparts at the national and regional level. Much of the action needed to fulfill global commitments to end poverty, reduce inequality and tackle climate change are the responsibility of local authorities. But there is also strong evidence that local governments cannot succeed without a proper enabling environment. Central governments largely determine the extent to which power and resources are devolved, and national policies and regulations play a major role in shaping urban form and function. WRI’s Robin King summarized three major challenges behind the crisis in urban to housing today: the growth of under-served, disconnected, sub-standard homes; an overemphasis on ownership; and land policies that push the poor to the periphery of cities. These housing and land use woes are closely connected to transport problems. “At the strategic planning level, the housing-transport connection is not established,” said LSE Cities Executive Director Philipp Rode. He spoke about recent research from the Coalition for Urban Transitions that shows the missing link between housing, transport and land use across case studies in 10 countries, from Nigeria to the United States. Demonstrating national leadership in India, Minister Hardeep Singh Puri unveiled a new initiative from the Ministry of Housing and Urban Affairs that aims to ensure every citizen has a home by 2022, the country’s 75th anniversary of independence. Puri said the Global Housing Technology Challenge seeks to build or incentivize the construction of 12 million new homes. “This program requires resources that, with humility, I can say, are way beyond our capabilities,” Puri said, but the challenge is meant to help draw resources and attention to the issue. “Housing is a fundamental need that must be satisfied,” he said, noting that to keep pace with rapid growth, India requires 700-900 million square meters of new commercial and residential construction every year, equivalent to the area of Chicago. As a result, too many people face a tradeoff between affordable housing, on the edges of urban areas and access to jobs in central areas, said Sameh Naguib Wahba, global director for urban and territorial development at the World Bank. He urged a focus on land ownership policies, noting that tension around informal settlements is a major challenge for cities of the global south. New technologies may help raise funds to expand infrastructure. A recent global survey found that new mobility services headlined by private companies like Uber and Lyft can also make public transport more affordable, accessible and sustainable, said WRI’s Diego Canales. Successful land value capture mechanisms like “CEPACs” in São Paulo and “betterment levies” in Colombia can help property owners and governments recoup funds to further invest in infrastructure. When this happens, “children in cities are more likely to be educated, which allows them to make more money, increasing wellbeing and GDP,” said Diego Fernandez, secretary of social and urban integration for Buenos Aires. Despite some innovative examples, the global funding gap for infrastructure is projected to be a staggering $49 trillion worldwide by 2030 without major changes, said Dan Dowling, director of cities and urbanization at PwC. Andrea Fernandez, C40’s director of governance and partnerships, talked about common barriers to raising money for cities. Many large cities simply don’t have the capacity or well-documented financial history to meet the requirements of big investors, she said. Mechanisms like C40’s Cities Finance Facility are working to turn great visions into more finance-ready projects and provide technical assistance and capacity building. Public-private partnerships can help in some circumstances, but Victoria Beard warned against relying too much on the panacea of private investment. In forthcoming research on water and sanitation provision, she noted they have found the private sector has played very little role to date. A thread that emerged throughout the day was an increasing focus not only on what needs to happen and how but who needs to be involved. We need to have more conversations about how get from technocratic solutions to political effect, Philipp Rode said, especially if we acknowledge that the change needed is dramatic. Indeed, WRI’s Jessica Seddon, closing out the session, announced that applications are open for the first WRI Ross Prize for Sustainable for Cities, an award meant to highlight transformative urban projects. Criteria include inclusive project planning and benefits, and upending entrenched ways of doing things. National and local policymaking need better coordination, but also better alignment with the needs of residents – a proposition tested in the World Resource Report through a focus on equity as a means to a better city for all. Experts from WRI Ross Center and the Coalition for Urban Transitions are engaging throughout the 9th World Urban Forum. For more, follow @WRIRossCities and @NCEcities. Emily Kaldjian is the Communications Manager for the Coalition for Urban Transitions. Schuyler Null is a Communications Associate for WRI Ross Center for Sustainable Cities. The $250,000 Question: What Does a Transformative Urban Project Look Like?